What we seek to do here is very simple. We want to praise God with our music and lead others to Him through song. Here’s how we try to do that! We want to use our voices to sing praises to God. 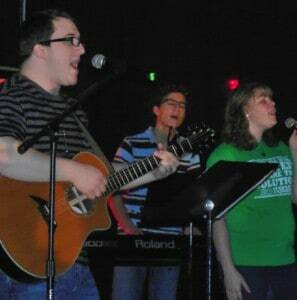 We have a worship choir that helps lead worship every Sunday morning. This is open to anyone! We invite you to join us at practice on Wednesday nights at 7:30 pm in the choir room at the end of C Hallway. You can like our Facebook page for more info (Marshfield First Baptist Choir) or join our email list for constant detailed updates. We provide sheet music for Soprano, Alto, Tenor, and Bass on every song we sing and go over it at each practice before we share it with the congregation. We also sing special pieces at Easter and Christmas and work on them months in advance so that anyone can be ready regardless of their music-reading ability. Recently we have sung at Springfield Cardinals games as well. We like to have fun and we like to take our task as worship leaders seriously together. This is just a few singers who are very confident in their part singing and song-leading who help lead worship each week on microphones. This team practices with the instruments on Tuesday nights in the sanctuary. The best way to get involved in this group is to start with choir and show consistency in leadership and musical ability. Psalm 150: 3 Praise him with trumpet sound; praise him with lute and harp! 4 Praise him with tambourine and dance; praise him with strings and pipe! 5 Praise him with sounding cymbals; praise him with loud clashing cymbals! We want to try to include as many worship leaders as possible in our singing and instrumentation. Of course, we want to play skillfully (Psalm 33:3) and worshipful. Right now we have acoustic guitar, electric guitar, drum set, bass guitar, piano, and keyboard as part of our regular instrumentation. We have also had strings, brass, and woodwinds. We don’t limit instrumentation but we do want to give the Lord our best. This is for strong players, but for those needing help to get to that point, we have worked several of our current players up to where they feel they can succeed. Whether it be sound, projection, lighting, or camera work, we have may different jobs that need to be filled each week in our media booth in the balcony. Anyone can be trained to do these tasks as long as they are willing and consistent. We have a youth band that is for students 6th-12th grade. They practice on Wednesday nights from 5:30-6 and they lead the RUSH worship service at 7pm. You can contact Chris (youth pastor) or Andrew to get involved in this group. We balance our children’s music with RAs, GAs, (1st-5th grade) and Mission Friends (pre/k) on Wednesday nights at 6:30. We have music as part of those groups most weeks preparing the children to sing songs in church on Sundays as well as Christmas and Easter programs. Psalm 96:1 Oh sing to the LORD a new song; sing to the LORD, all the earth! Psalm 149:1 Praise the LORD! Sing to the LORD a new song, his praise in the assembly of the godly! We sing old songs, we sing new songs, we sing psalms, hymns, and spiritual songs and we do it with as many worshipers as we can. That’s what the Bible tells us to do so we will rest in that and give the Lord our best each week. Come join us! Contact the Worship Pastor, Andrew at Andrew@marshfieldfirst.org or call the church at 417-468-2330 for more information.